Sabena technics, a family-owned group, is an independent provider of MRO services (maintenance, repair and overhaul) to civil and military aircraft operators. With a presence of 18 sites in Europe, the Americas, Middle-East and Asia, it employs approximately 3,000 people. 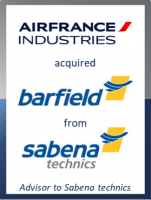 Barfield Inc. is Sabena technics’ wholly-owned subsidiary in the USA (Miami, Phoenix, Louisville), also covering the South-American market. It employs around 220 people. As part of a refocusing on certain commercial and military activities, the Sabena technics Group decided to divest its activities in the Americas.